When it comes to critical environments like computer hard drives, contamination by extractable organics like silicone puts product function and reliability at risk. For many hard drive manufacturers, silicone transfer from release liners to the adhesive being used in hard drive components is of particular concern. Why? Because silicone, a synthetic compound, can be inadvertently introduced in a myriad of ways. In addition, it has a tendency to volatilize and migrate within a confined area, which can cause product failures. The good news is that silicone contamination testing for hard disk drives, electronics, and other critical environments is possible thanks to a variety of chemical testing techniques. Of course, the right testing technique depends on the sample and the problem. Typically, when looking for the presence of silicone or other soluble organic contaminants, a component is rinsed with a solvent, the solvent is then evaporated, and the remaining residue is analyzed using Fourier Transform Infrared Spectroscopy (FTIR). But what happens when the component is incompatible with the solvent, as is the case for most adhesives? 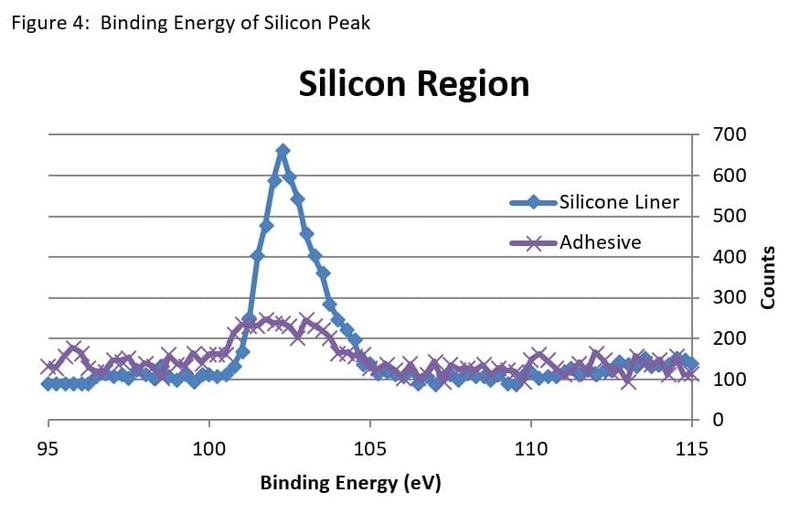 When it comes to determining silicone transfer from release liners to the adhesive surface, Electron Spectroscopy for Chemical Analysis (ESCA), a surface analysis technique, works well and avoids the issue of the solvent/adhesive incompatibility. Read on to learn how our team of scientists has tackled this issue for one of our hard disk drive clients. A manufacturer was concerned that a silicone-treated release liner, which was in contact with a pressure-sensitive adhesive, was transferring silicone to the hard drive component the adhesive was used in. The manufacturer needed an expert to analyze the liner and the adhesive to determine if silicone was present on the adhesive, and if so, whether its presence fell within acceptable levels. If silicone was present at unacceptable levels, the end user would reject the product. In most situations, solvent extraction followed by the use of FTIR analysis is the best means of identifying the presence of extractable organics. But given the unique nature of our client’s problem, we knew solvent extraction of the adhesive would result in removing some of the adhesive, which could mask the presence of low levels of silicone in the extract. As a result, our team of analytical scientists opted to analyze the samples using ESCA techniques. ESCA, which is also referred to as X-ray Photoelectron Spectroscopy (XPS), uses an x-ray beam to excite atoms on the surface of a solid sample to release photoelectrons. These photoelectrons store important elemental and chemical bonding information about a sample’s surface, allowing us to examine and identify the elemental makeup of a surface—including any contaminants. Generally speaking, the presence of silicone or silicon, the naturally occurring element, isn’t necessarily detrimental. Every manufacturer has their own standards for acceptable levels of silicone. With this in mind, we moved forward to quantify the amount of silicone transferred to the adhesive surface from the liner. Below, you can see the unique elemental and binding information for both the release liner (Figure 1) and the adhesive (Figure 2). With this information in hand, we then moved on to examining the specific atomic percentages for each of the elements that were identified, which is represented in Figure 3 below. Lastly, we compared the binding energy information for each of the samples. 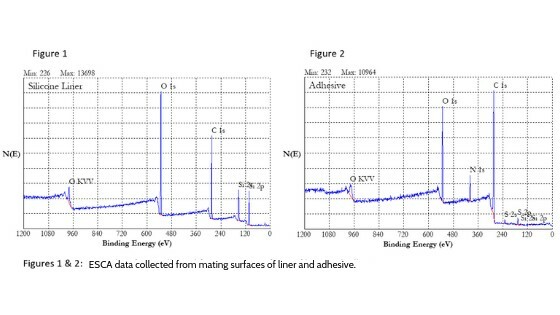 Below, Figure 4 shows the comparison, with the liner’s data in blue and the adhesive’s data in purple. What do these graphs tell us? The silicone-treated liner has a significant amount of silicon, which is present as silicone, on its surface. In fact, it accounted for 24% off its makeup, which is roughly what is expected from a release liner treated with polydimethylsiloxane. As for the adhesive, which was formulated without silicone, testing revealed that 0.8% of silicon was present as silicone on the surface directly below the liner. This told us that the silicone present on the surface was likely due to transfer from the release liner. And this meant that silicone would be introduced to the critical environment that the adhesive was to be used in, which could potentially cause future failures. With this information in hand, our client was able to determine that they needed to make a change to release liners with lower levels of silicone. Are You In Need of Silicone Contamination Testing? When it comes to critical hard drive components, determining the presence of silicone, or other extractable organics, may be key to maintaining the integrity of your product. ESCA testing and analysis, which offers other wide-ranging surface analysis capabilities, may be just what you need. For more information on our hard drive microcontamination testing and analysis capabilities, check out our Hard Drive Industry page. If you’re wondering if ESCA or another technique may be a good fit for your testing needs, get in touch with us today or fill out our Request a Quote form.